Naturally, Franzen found himself stuck with the unfortunate reputation of a highbrow snob, a characterization that seems utterly bizarre if you’ve read his work and are aware that he’s a straightforward, accessible, and completely absorbing entertainer with an immaculate ear for everyday turn-of-the-millennium speech. 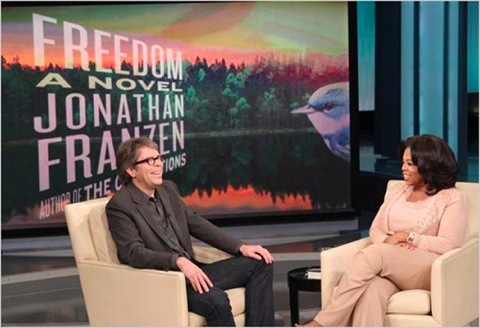 Winfrey named Freedom to her Book Club in 2010 and Franzen accepted, finally appearing on the show (footage here), but that hasn’t stopped the flap over The Corrections from dogging him everywhere he goes. Read some of the grumbly backlash to the Kenyon College address and you don’t have to scroll very far down to find a jab at the incident. Ms Winfrey is undoubtedly clever enough to be in on her own game. One doesn’t blindly invite guests like Jonathan Franzen or bizarrely, Cormac McCarthy, whose Oprah interview is only rivalled in the annals of shattered reclusion by Thomas Pynchon’s Simpsons cameo. Yet these are precisely the writers for whom literature is a refuge from the cacophony of mass-cultural unreality, and who know better than most that embracing the depths of human misery rather than buying or drugging them away is the key to preserving our sense of self. Despite our privileged first-world comforts, we need to reassert our right to be miserable, lonely saps. That’s the Franzen paradox: through solitude, we can recover empathy. In the long conversation about whether there is a place for literature in a culture saturated with disposable entertainment and projected façades of human contact—an anxiety we can trace back to Franzen’s Harper’s essay from 1996, David Foster Wallace’s meditation on television at its zenith in “E Unibus Pluram”, or most presciently in Ray Bradbury’s Fahrenheit 451—the printed page is a conduit for recovering humanity, not for retreating away from it. This is a major concern for Richard Powers, too. Compared to Franzen, Powers is more of a technological optimist (we’re talking about the fellow who dictates his novels into a tablet computer, remember), but he also considers the social effects with the warranted ambivalence. Russell Stone, the protagonist of Generosity, forms preconceptions of someone he hasn’t met based on her profile picture and upends a psychiatric diagnosis with a term he picked up on Wikipedia—and he’s far from the only one in the book to behave in accordance with how he’s wired. The novel centres on Russell’s incomprehension of someone who has every reason on paper to feel worse than he does, but doesn’t. Powers’ earlier novel Galatea 2.2 tackles the problem of humanity-via-fiction head-on, reimagining Alan Turing’s imitation game as an exercise in understanding literature. Where the notion of the literary refuge runs into trouble is when we consider market dynamics—the production and promotion of books. The trick to understanding how literary values mesh with Oprah values may lie at this junction, I think: long-form reading provides an outlet from the commodified morass, but it’s sold and distributed as a commodity itself. It may be strange to think of a big cerebral novel as falling into the fiscal category of an entertainment product, but where accounting is concerned, publishing is publishing and books are merely books. In the end, everything gets the covers stripped and pulped. This isn’t to say that Oprah’s Book Club is all about the money: the books have more to benefit from it than the show, and Winfrey’s taste is honestly not too shabby. But its project is to direct consumer behaviour, and the objects held up to the audience, as complex as they may be inside, are promoted as consumable remedies like anything else. Better literature than quack medicine, I’d say. More worrisome is how market conditions may transform or limit, going forward, the kind of literature we see produced. We’ve all witnessed in the past x years (five, ten, thirty, pick your frame) how a market-driven, consumer-dictated approach to cultural production has driven popular cinema and music into the ground, while a good chunk of television has never gotten off the ground. If good books of richness, depth, and intelligence are sold on shallow terms, do we really get any closer to developing a culture of interpretive independence and nuanced thought? Or by selling the novel as a typical entertainment medium, are we just asking for it to be replaced? The association of Oprahfication with lack of depth is clearest in critiques of Oprah’s effects on the reading public. Lofton, like others, is skeptical of the interpretive approach to reading that Oprah encourages in her book club: she stresses that Oprah’s interpretations, which encourage readers to react emotionally to a book and relate its characters to their own lives, lack depth and reduce books to their ability to “return women to an Oprah way of life,” reiterating the core theme of Oprah-as-icon. […] One could also draw a comparison with Sesame Street, which uses the idiom of commodities to “sell” reading to kids. Both Oprah and Sesame Street effectively reach and shape a self who always already inhabits a commodified world. By integrating quality fiction into her audience’s existing way of life, the argument goes, Winfrey strips away the class-boundary stigma that isolates literature as a highbrow domain, cut off from everyday consumer society. Admirable enough, to be sure, but I think there’s a catch: some novels simply want to be apart. (Glenn Beck, who prefers to champion military thrillers for boys, doesn’t have this problem.) Ignoring for a moment the ocean of work-to-order books that are written to fill market needs and meet bottom lines, which entertain readers suitably enough and exist to be liked, not loved, it’s in the nature of the novel to resist its own commodity packaging. The double nature of a book like The Corrections is that it functions equally well as a serious novel and as salable commodity entertainment—maybe even with a tilt towards the latter. In any case, this sheds some light on how we’ve since ended up with Jonathan Franzen, Ironic Celebrity. 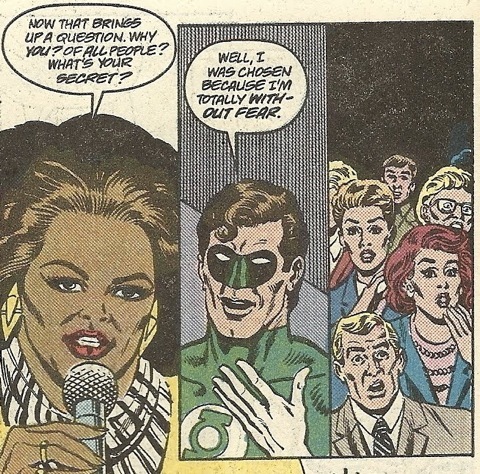 It’s not just Oprah, either. Consider this: Lev Grossman, the former tech-gadget journalist who has somehow remained employed as the senior book critic at Time in spite of the trendspotting, early-adopter triteness that infects his cliché-ridden drivel—got Franzen on the cover of the magazine last August, making him the first novelist to sit inside the big red box since Stephen King in 2000 (for a story about King’s online strategy, not his books). The literary cover gallery tells a vivid story of the decline of novelists in American popular consciousness, but that’s neither here nor there. 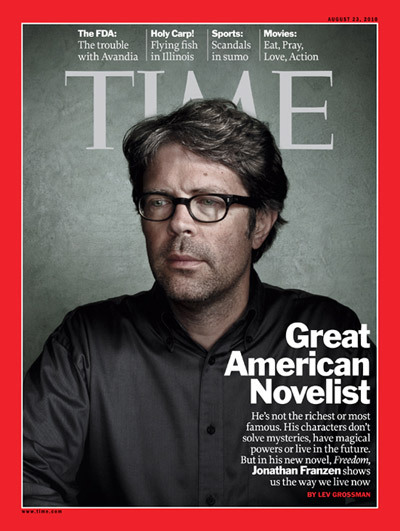 The point is that for all the welcome benefits of mass exposure, Time wasn’t doing Franzen’s reputation any services with its insipid, off-the-shelf, the-way-we-live-now hype. The attitudes to literature on display could not be less compatible. Take a look at Grossman’s screed in The Wall Street Journal, “Good Novels Don’t Have to Be Hard Work”—still one of the most heinous acts of attempted criticism to grace a major publication in recent memory, in which the sentence “This is the future of fiction” is actually, earnestly said. Now compare it to Franzen’s post-Oprah essay on the subject of accessibility, “Mr. Difficult: William Gaddis and the Problem of Hard-to-Read Books”. Grossman opts for snap judgments, populist scapegoating, and bad history; Franzen makes a serious effort to sketch ideologies of the author-reader relationship. Yet look who’s connecting with the wider public. This entry took several hours of my life, since I invariably clicked on and read any of the linked documents that I hadn’t yet (I’d already read Grossman’s contemptible essay and knew enough to give it a wide berth, however), and so on and so forth down the rabbit hole. I find Franzen’s friendship with D.F. Wallace to be very interesting indeed, since the two seem to indicate two apposite entries in the same series. Wallace seemed always to take a formal position against abstrusity and overly-complicated language, and yet wrote abstruse and overly-complicated books (admittedly some of the best work of our time); meanwhile, Franzen, despite his confession of mixed feelings in “Gaddis”, seems to enjoy the notion that good novels can/should be suitably difficult, and somehow writes novels that are deceptively accessible. It’s an old conversation, I suppose, but it comes down to Grossman’s notion of “Good”, which stupid prats use interchangeably with “successful”. As some relevant context, it’s worth noting the venue’s special resonance: Wallace also made a commencement address at Kenyon College several years ago. After reading it, Franzen’s speech feels very platitudinous in comparison, which goes to show that even writers of his calibre look tame next to Wallace’s sheer exuberance. “This is Water” was DFW at his most brilliantly accessible. In fairness, graduation speeches are not the sort of thing I would expect Franzen to be good at, anyway. I can only imagine the reason he agreed to do it is for that very resonance. In general, when an artist or group of artists put forth a manifesto, the principles announced are the exact opposite of their actual practice. Thus the Imagistes talked a lot about concrete imagery while being as vague as possible in their poetry.